A powerful and exciting film, epic in scope, about a families brush with both romance and brutal violence. 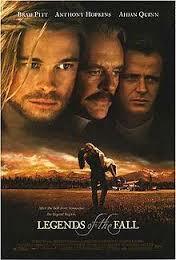 Legends Of The Fall is a movie that tells the story of three brothers and their father and how time changes them all. It’s a movie that has guts, which is startlingly refreshing in today’s day and age. Main characters are killed and others cross lines with what they do and with each other. Characters hold grudges in this movie and the conflict between father and siblings is on the level of the great works of Shakespeare. Instead of competing for who will take over their father’s legacy, or throne, however, these brothers compete for the love of a woman. It’s a daring idea to have a movie based around this concept. We’ve seen friends compete for the same woman, but never three different brothers. In addition, each brother gets with her too, in one-way or another. That is to say, the relationships between this woman, Susanna, (Julia Ormond) and each brother represents a different time period and stage in the brother’s lives. The movie starts out when the boys are little, establishing the family, why their mother doesn’t live with them, why they live on a farm all the way in the isolation of the mountains, and who each brother is. In particular, there is a focus on Tristan, (the brad Pitt character), who is the most rebellious and animalistic of the three. Tristan is in touch with his spiritual side, but he also does things without always thinking or having reason. As a child, he wrestles with a bare, gets hurt by the creature, but manages to take the bear’s claw. He’s passionate, but also a little crazy. The boys grow older as American history approaches the First World War. Two of the brothers live at home with their father (Anthony Hopkins), while the youngest brother, Samuel (Henry Thomas), lives in town with the mother. Samuel is coming back home to introduce his fiancé (Ormond), to the men of the family. In addition, that’s where the story really gets started. The boys end up all going off to war together, despite their father’s protests. The night before going, Tristan and Susanna end up having a moment together that looks as if they are having an affair. 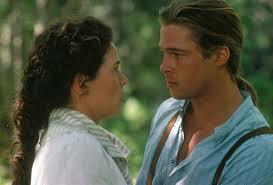 There is certainly chemistry between them, and older brother Henry (Aidan Quinn) catches them. This is a moment that will stay in both brothers’ heads for years to follow. The three boys go off to war with Tristan going solely to watch over his younger brother, Samuel. Something goes wrong and one of the brothers is killed. This moment as well as the way Tristan reacts to it is handled so Delicately and with such great attention to detail that it is both powerful and haunting. The second half of the movie is about the brothers after they have returned from battle. Susanna takes up with another one of the brothers only to find that he is lost and needs to go out to the world to experience and explore. That brother, Tristan, has always been a wild card. He’s the bad boy who is totally unpredictable and it’s the reason why Susanna finds him so irresistible. The characters start to grow old now, as the movie approaches its third section. Susanna waits and waits for Tristan to return, and eventually settles down with another. When Tristan does return, things have changed. The father as well as Henry and the life he has made for himself, have all gone through drastic transformations. But the final section is not all about wrapping things up, and has an isolated storyline of it’s own, involving bootlegging and more conflict and death. This movie keeps the energy and violence going strong throughout the film and that helps us stay riveted and on the edges of our seats. A number of the main characters meet their deaths here, often in unsuspecting ways, which is all the more reason why this tale resembles the work of Shakespeare. Legends Of The Fall are a tremendous movie. It’s a film by Edward Zwick, the director who pursues projects involving both nature and history with powerful storylines. This is the guy who made glory, the last samurai, blood diamond, courage under fire, and the siege. He generally makes good movies, and legends of the fall is quite possible his best. That’s because the story is fully loaded with powerful moments and surprises as well as dramatic plot points and exciting action. Zwick is the kind of director who falls right in between the nature of Terrence Malick and the battle action of Ridley Scott. He is all about making realistic films with moving stories and with legends of the fall he absolutely delivers.